Empowering People with Virtual Reality! 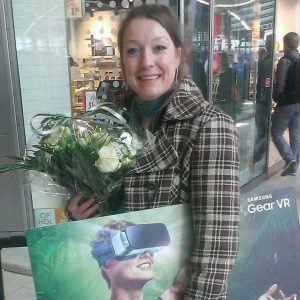 Dana-Maria Faneker has won the Samsung VR Challange for the best VR idea in the Netherlands. That means that Samsung is going to help her to launch this idea called:” Fear or Love!” first as a pilot in the Netherlands and then maybe worldwide. With her Start-up called ”CaptainVR” she is educating coaches, trainers, therapists and psychologists to work with this new technology. So they can help people to get rid of all their fears and trauma’s, so they can realize their goals and dreams. Her mission is to help people to become the Captains of their Lifes. Rather than slaves TO their lives, or of their behaviors. With Virtual Reality this is now possible in the most powerful way. CaptainVR is introducing very effective Virtual Reality Coaching applications that will empower people in the most effective way.